Great chart from Calafia Beach Pundit. 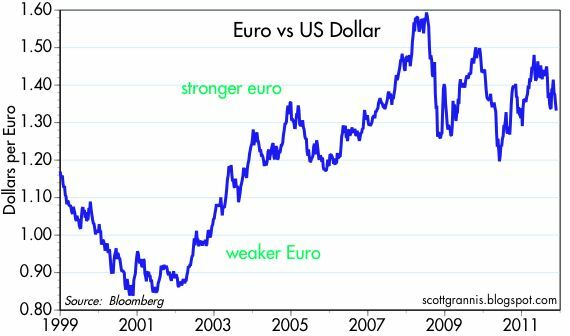 If the Euro was so weak, than why has it held up so well against the greenback? Sure the Euro isn't near the peak around $1.6, but it clearly isn't anywhere near the sub $1.20 it traded below for the first several years. One possible answer is that traders expect some of the weak participants such as Greek to leave the Euro, therefore leaving the stronger countries like Germany that would cause a rise in the Euro. Other scenarios are that the US dollar has been just as weak. Either way, the demise of the Euro seems very premature especially when looking at this chart. If that was about to happen wouldn't it sink below parity and fast?